What I Wore: 6/20/2011 | Oh Sarah O ! 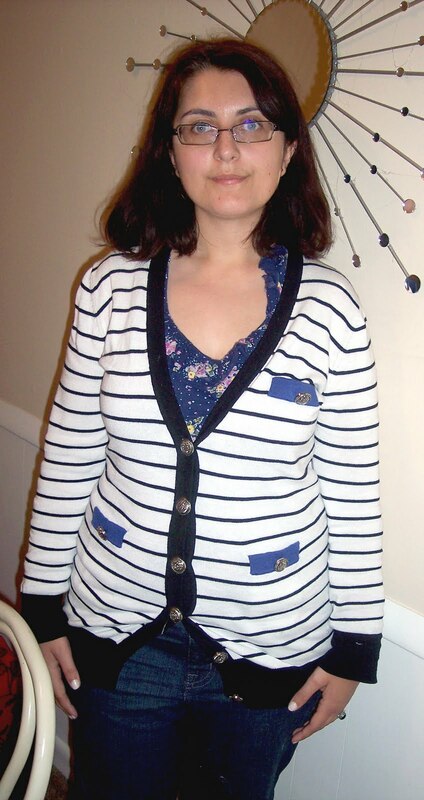 The Fab Finds Under $50 Outfit Inspiration calender said to "pair floral with stripes," so I paired my striped cardigan with pops of blue with my blue floral tank top for a polished look to wear to work. I also did battle with a severe storm (with 70mph winds, torrential downpours and pea to marble sized hail) in my car while wearing this outfit (hence the slight look of unease on my face). Luckily, me and my car made it home safely and undamaged.